DETAILS: This beautiful and cozy home is conveniently tucked away in the quiet, peaceful WaterColor Forest District. Featuring 5 bedrooms and 4½ bathrooms, this home is perfectly suited to accommodate 16 guests. Upon entering this home, guests are greeted by its warmth and charm—the perfect first impression to start a relaxing beach vacation. The living, dining, and kitchen areas share an open-concept floorplan, which allows guests to make the most of their time together. The kitchen, which features beautiful granite countertops, custom ivory cabinetry, and top-of-the-line stainless steel appliances, offers a spacious place to enjoy preparing meals. The adjacent dining area offers seating for six guests at the dining table, with seating for an additional six guests at the breakfast bar. In the living area, comfortable seating and a large flat-screen television create an inviting space to gather and relive favorite memories from the day. A spacious laundry room offers a front-loading washer and dryer and a large sink. The master bedroom in this home is a beautiful king bedroom on the first floor—which boasts a private bathroom with double sinks, a shower, and a separate soaking tub. This bedroom features French doors, which allow lots of natural light into the space and provide access to the spacious outdoor porch. 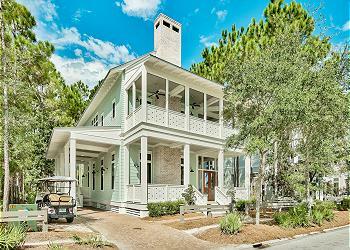 Guests will enjoy relaxing on the expansive porches, which are well adorned with comfortable, coastal furnishings. The tree-lined property and peaceful surroundings of WaterColor Forest District invite guests to savor the slow, intentional moments of a 30A getaway. On the second floor, guests will find a variety of sleeping arrangements. The first guest bedroom offers two twin over queen bunk beds and a shared bathroom with a large glass-front shower, a single vanity, and lots of towel hooks. The second guestroom features two queen beds and shared bathroom. The third and fourth bedrooms upstairs each offer a beautiful king bed and private bathroom—one with a shower and the other with a shower/tub combo. Love the house and location! It was a couple blocks from the beach but if ride bikes or rent the golf cart you are good to go! The rooms were good size and the house was clean! Only the master shower had mildew so hopefully they fix that for the next renters. The master bedroom could use a dresser for your stuff if you are staying for a week. The other rooms had a bench or something. I would stay at this house again in a heartbeat! We are so glad you enjoyed your vacation with us in Watercolor! We agree that this home is in a wonderful spot and is perfect for a carefree beach getaway! We will share your valuable feedback with our team regarding the mildew in the master bathroom shower. We hope to host you and your group again soon!